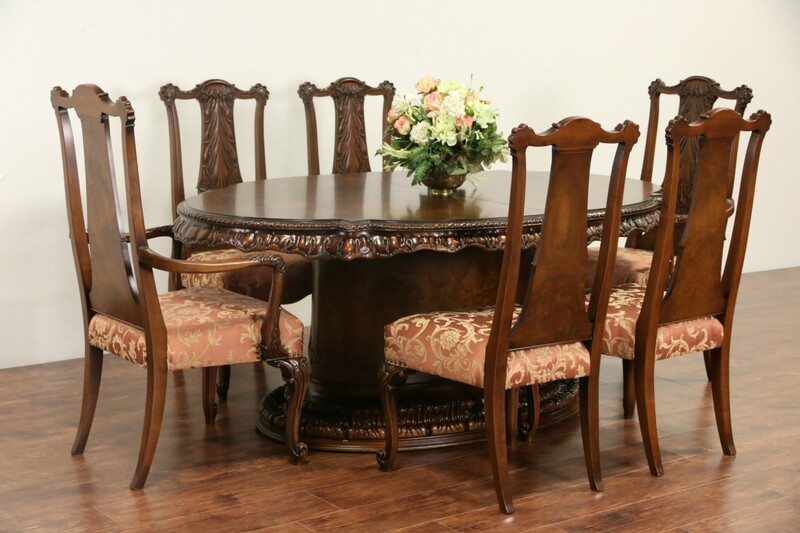 Carved by famous maker, "Romweber" of Indiana for their "Louis XV de Gaulle" collection, this dining set includes a table with two leaves and six chairs. Depicted in their 1942 catalog, the finish is in excellent condition on acacia and walnut woods with matched burl panels. This striking design was unique to Romweber, whose furniture was sold to the White House. Measurements of the vintage table are 50" wide, 29 1/2" tall, legroom is 25" and length when closed is 74," with both 12" wide leaves in place, length is 8' 2" overall. Chairs are tight and strong, newly upholstered in European fabric. Two armchairs measure 25" wide, 24" deep, 42" tall and seats are 18" high, four side chairs are 20" wide and 22" deep. Matching pieces in photos are priced and sold separately, call or email for availability. See 29 photos on Harp Gallery website that enlarge to full screen size.